The ruling political cartel hurled Nepal into an unprecedented constitutional crisis last week. 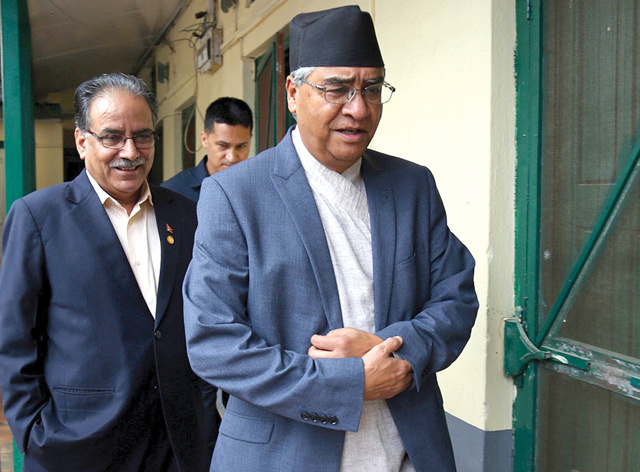 An impeachment motion was registered in Parliament against Chief Justice Sushila Karki, seen by many as an anti-corruption crusader deeply committed to strengthening the rule of law. The grounds for impeachment were so evidently whimsical, and the process so undemocratic and un-parliamentary, that it sparked spontaneous protests from the general public and drew sharp international criticism. Although the Supreme Court has now annulled the impeachment motion by an interim judgment, the political crisis has laid bare fault lines in the new Constitution, triggering a debate about provisions for the separation of powers. But that may be turning the gaze in the wrong direction. When the new republic is striving to ensure that the Constitution gets wide acceptance, this selfish act driven by the pique of top leaders has raised serious doubts about the survival of Nepal’s democracy itself. It proved beyond doubt that the top political leaders of the country are not just part of the problem, they are the problem. The Constitution that is supposed to institutionalise the federal republic is yet to be implemented. The first step would be the three tiers of elections this year. With some of the Madhesi forces ready to be part of the process, with some conditions, the battle was only half won. But at such a crucial time, what the NC’s Sher Bahadur Deuba and the MC’s Pushpa Kamal Dahal did was utterly reckless. It is now clear that the impeachment move was a result of a conspiracy to keep Chief Justice Karki off some high-profile corruption cases for the two months that remained of her tenure. It was also an act of revenge on her for hurting the egos of top leaders, especially Deuba, who was prevented by a court order from appointing a police chief of his choice. Post-conflict consensus politics, now a decade-long malpractice with intricate and interconnected dark areas, has spawned a culture of opaque decision-making by all organs of the state. This in turn developed a sense of entitlement in top leaders. The silence of civil society and the international community in support of the democratic process has in the past few years made the situation worse. Finally, it was the UN human rights office (OHCHR) that deigned to condemn the impeachment move because of what it meant for the transitional justice process. Along with the lack of elected local government, transitional politics has created a corrupt eco-system that has turned the country into a nexus of crime and politics, with the top leaders at the helm. Their undemocratic internal decision-making was no secret, but this crisis has shown just how dismissive they can be of international norms, public opinion and the democratic culture. The choice of candidacies for local elections is another proof of this political decay. The mayoral candidate of the Nepali Congress for Bharatpur Metropolitan City was forced to withdraw by NC President Deuba. This despite open protests by party workers refusing to help the candidate from the Maoist party, Renu Dahal, the Prime Minister’s daughter. The main political parties have become the root cause of this democratic degradation. The inability of the lower ranks of the parties, as elected representatives of the people, to stand against the whims of the top leaders shows just how much they have let down the country and its people. Mute acceptance by the Young Turks in the main parties of the dictatorial style of top leaders has killed any hope of change in the near future. The only hope now is for the emergence of a strong, alternative political force. Some of these new entities are fielding candidates in coming elections and could bring about sweeping change to brush away the established parties. That is the only way democracy can be saved. "It is inhuman to separate mothers from their children"